Shickshinny Lake is located in Union Township in western Luzerne County of Northeastern Pennsylvania, between the unincorporated areas of Muhlenburg and Huntington Mills, approximately six miles northwest of the borough of Shickshinny. 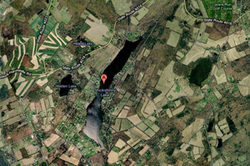 The Association is comprised of property owners in the Shickshinny Lake development surrounding Shickshinny Lake. The original development planned for a community of 250 properties maximum; at the present time, almost 200 of those 250 properties are owned by private individuals and families. The remaining 50 potential properties are owned by the developer who continues to add building lots to the development for sale. All property owners are required to belong to the Association and their property deeds serve as membership certificates. Minimal dues and assessments are levied annually to provide funds for the upkeep of the common areas and parks, and to maintain the purity of the lake water itself. The Association also sponsors a number of community activities for residents and their families throughout the year, such as a December visit from Santa complete with gifts for children, a visit from the Easter Bunny and an Easter Egg hunt, socials during membership meetings, and gifts for new residents of the development. In addition, a Fall fellowship covered-dish social is held at one of the community's parks. The lake itself is a private impoundment of about 160 acres of water, constructed in the late 1960s by damming a branch of Marsh Creek and flooding three farms to form the lake. Fed by a system of creeks and springs, the rural surroundings of the lake provide a pristine environment for year-round residents and for seasonal occupants while maintaining its rustic charm. As a private lake, only members of the Association and their guests may use the Lake, adding to the desirability of membership. The Association contracts with a state-licensed, private environmental firm to monitor the quality of the lake water and to add such chemical treatments as are necessary to maintain the purity of the water for recreational purposes. Domestic water is provided by a Pennsylvania-licensed public utility, although some properties are served by private wells. On-site sewage systems are required by the Township. Main Road is maintained by the Pennsylvania Department of Transportation; Seneca Drive, Cherokee Drive, and Apache Drive are maintained by Union Township. Luzerne County administers zoning requirements for the township and for the development.